The part of the brain called the hypothalamus contains the body's "clock"
(CNN) -- If you have a hard time crawling out of bed in the morning, it could be that your body is biologically programmed to start the day later. Some people who appear to have insomnia are biologically night owls, one expert says. Experts say a spectrum of natural sleeping and waking rhythms exists, ranging from extreme morning people to extreme "night owls." A new study examines how morning people compare with night owls on a strength test and looks at what other physiological processes may contribute to their performance. Researchers tested participants' leg muscle strength at various points in the day. They looked at nine "early birds" and nine "night owls," who were classified as such based on a questionnaire. Surprisingly, morning people's strength tends to remain constant throughout the day, but night owls have peak performance in the evening, said researchers from the University of Alberta in Canada. That may be because evening people show increased motor cortex and spinal cord excitability in the evening, about 9 p.m., meaning they had maximal central nervous system drive at that time, Lagerquist said. Morning people, on the other hand, never achieve this level of central nervous system drive because the excitability of the motor cortex does not coincide with the excitability of the spinal cord. In other words, these two measures never peak at the same time, he said. Early birds' brains were most excitable at 9 a.m. and slowly decreased throughout the day. Researchers don't know whether this means evening people who are athletes are necessarily better off. Although night owls may maximize their strength in the evening, they are at a serious disadvantage if they have to compete in the morning. Morning people, on the other hand, would have the same average performance regardless of the time of the competition, Lagerquist said. Based on the findings, Lagerquist recommends that people who struggle athletically in the morning try going to the gym at night, as they may feel more awake and perform better then, he said. The study reinforces findings that athletic performance varies over the course of the day, said Dr. William Schwartz, professor of neurology at the University of Massachusetts. Although the study is small -- 18 people participated -- it highlights problems with being a night owl that sleep experts often see in patients. American society favors morning people, because the typical work day begins in the morning and ends in the evening, said Dr. Nancy Collop, Medical Director of the Johns Hopkins Sleep Disorders Center. Her sleep center tends to have many more night owls seeking help than early risers, she said. Fairly commonly, people come to the sleep clinic at Johns Hopkins having been mislabeled as insomniacs when they are just night owls, Collop said. "Their body clock is separate from what their work clock is supposed to be," Collop said. It's very difficult for a night owl to become a morning person, Collop said. 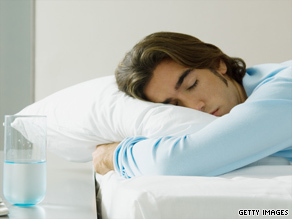 At a sleep clinic such as the one at Johns Hopkins, people seeking to change their habits may be asked to sit in front of a very bright light early in the morning and to take melatonin to help them sleep earlier. Melatonin is a hormone that helps regulate circadian rhythms, the daily rhythms that persist in the body within a period of about 24 hours. The tendency to do certain actions at particular times of the day is a phenomenon seen across the animal kingdom. Even single-celled organisms do different tasks at different times of the day, Collop said. More complex organisms also need a rest period built into the 24-hour cycle. In humans, light drives this cycle, she said. The part of the brain called the hypothalamus contains the human body's "clock," Schwartz said. There is evidence that biological rhythms are dictated by genes, although people can train themselves to some degree, he said. Teenage and young adult males have the highest risk for delayed sleep phase, or night-owl tendency, she said. But it's hard to know how much of that comes from genetics and how much comes from social pressures, she said. CNN's Shahreen Abedin contributed to this report.